Šri Hanumãn stands with His palms pressed together, expressing His devotion for Šri Rãmã. 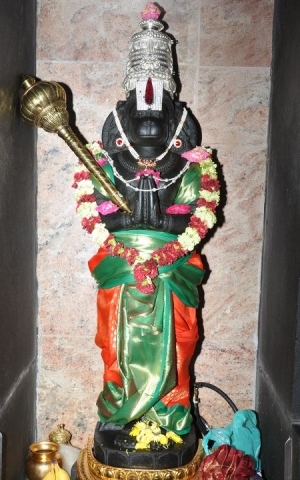 Šri Hanumãn was Šri Rãmã’s ardent and humble devotee. Šri Hanumãn could give us the mental strength required when tackling any problem, and also the inspiration to become a selfless model devotee in service of our Lord, Who is within us all. UTSAVA ŠRI HANUMÃN : Šri Hanumãn, instantly recognizable by the face of a monkey, He is portrayed with palms clasped in devotion to Šri Rãmã. Praying to Šri Hanumãn would empower us with positive messages of courage, humility and selfless service to Šri Rãmã.